PHOTO TO BE ADDED Main face of Carnmore Quarry, Co. Fermanagh, exposing sandstones of Carnmore Sandstone Member of Meenymore Formation. This is the stratotype for the Carnmore Sandstone Member, a new lithostratigraphical unit within the Meenymore Formation. The quarry is excavated in lithologies typical of the member and demonstrates a variety of sedimentary structures. Carnmore Quarry is located about 400m NE of Carnmore Lough. In the quarry the sandstones consist of pale grey-fawn, very coarse- grained to medium grained litharenite with pebbles scattered throughout the matrix and concentrated in thin, discontinuous beds. Detail of main face showing discontinuous pebble beds and large scale trough cross-laminations in coarse-grained sandstones of Carnmore Sandstone Member. Pebbles and coarse grains consist almost exclusively of polycrystalline quartz, muscovite quartzite, sheared quartz, quartz showing evidence of strain and vein quartz. In thin section no feldspars are evident and detrital micas are relatively scarce. No cement is usually present with the exception of small amounts of clay minerals and iron oxide and, exceptionally, in a few layers, ferroan dolomite which imparts a bright orange stain to the rock upon weathering. Sedimentary structures in the quarry only provide ambiguous evidence for the provenance of the sand and pebbles. Crude ripple marks on two bedding surfaces suggest currents flowing to an azimuth of 280 deg. Medium and large scale, trough-cross stratification indicates currents flowing, in two examples towards the east and east-northeast, and in one other towards the west-northwest. The composition of the Carnmore Sandstone appears to indicate either a mature source area, probably composed of quartzose metamorphic rocks, or a derivation from a distant source area, thus allowing time for feldspars and softer lithologies to disintegrate and weather to clay minerals. The latter possibility is, however, not supported by the relative angularity of clasts and in particular of quartz grains in the matrix. Under these circumstances it seems unlikely that the Lower Palaeozoic rocks of the Down-Longford massif, to the south of Carnmore, were the source area and an alternative must be sought. 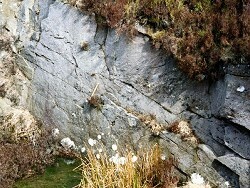 Carnmore Quarry is the stratotype section of the Carnmore Sandstone Member of the Meenymore Formation. Key Site 1175 - Subarea-2; Lisnaskea and Fivemiletown. Approach: ~400m northeast of Carnmore Lough. GSNI (1991) 1:50,000 Sheet 44, 56 and 43 (Derrygonnelly).